Waitrose Smoked Danish Bacon Lardons are small, bite-sized pieces, and make a good choice for adding to quick and easy dishes such as this salad. Tossed with salad leaves and sweet, juicy mango in a tangy mint dressing, this recipe is perfect for summer. Serve with warmed, grainy bread. Unsmoked lardons are also available. Pull the mint leaves from the stems and chop finely. Place in a small bowl with the oil, vinegar, sugar and seasoning. Whisk until combined, then set aside. Tip the bacon lardons into a heavy-based frying pan, preferably non-stick. Fry over a high heat, stirring frequently, for 6-8 minutes, or until the bacon is crisp and golden. Drain on kitchen paper. Halve the mango either side of the flat stone. Cut away the skin and cut the flesh into thin slices. Halve the chicory and cut each half into thin wedges. 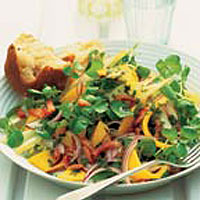 Place the bacon, mango, chicory, watercress and onion in a salad bowl and mix together. Add the dressing and toss the ingredients together lightly. Serve with warmed bread, such as Waitrose Granary Baton. A really ripe, juicy mango is essential for a fresh, tangy flavour. Alternatively, choose another sweet, ripe fruit, such as pears or peaches. 14.1% fat per serving. As a starter: 313 kcal/26.1g fat/14.1% fat per serving. This recipe was first published in Tue Jul 01 01:00:00 BST 2003.